Boardmasters, Cornwall’s own surf and music festival, has today announced its first headline act set to take to the main stage this summer will be UK singer-songwriter of the moment, James Bay. Boardmasters returns to the stunning sun-drenched Cornish coastline for another year, giving festivalgoers the best in surf and music. The festival runs from Wednesday 10 – Sunday 14 August 2016. Tickets are on sale NOW via the website. British homegrown talent, James Bay is riding the wave of platinum-selling success, with his No.1 debut album, ‘Chaos and the Calm’, featuring one of the biggest hits of the year ‘Hold Back The River’ and his current worldwide tour is selling fast. Having been honoured with the Critic’s Choice award at last year’s BRIT’s, he’s been nominated for a massive four awards at the 2016 ceremony and is also in the running for three Grammys. Continuing its role in bringing the hottest new acts to the South West, Boardmasters is stoked to welcome James Bay as he continues to dominate the UK and global music scene. Fans are in for a treat, with James Bay set to put on a spellbinding performance when he takes to the main stage for his first headline appearance. 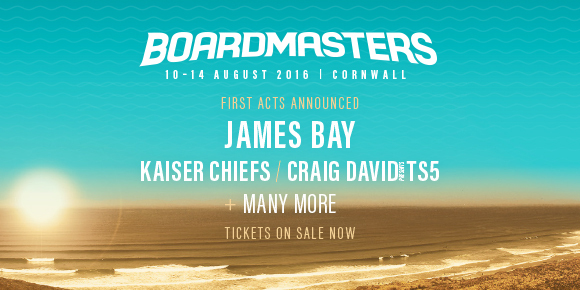 Boardmasters has also announced further acts to perform at this year’s festival. First up is the undisputed king of the UK garage scene Craig David, tipped as one of the most hotly-anticipated comeback acts of 2016, with his latest hit ‘When The Bassline Drops’ currently storming the charts. Also announced are some of the UK’s hottest music acts - Kaiser Chiefs, Jamie Lawson who signed to Ed Sheeran’s record label last year, Example, Sigma, Wilkinson, BRITs British Breakthrough Act nominee Wolf Alice, Jack Savoretti, Gabrielle Aplin, MNEK, Nahko and Medicine for the People who will join James Bay and Craig David for what’s sure to be a weekend of high-octane performances from the biggest names in music. Established in 1981, Boardmasters is a 5-day event situated across two stunning locations in Cornwall - the surfing mecca of the UK, Fistral Beachwhere Boardmasters famous International Surf Competitions take place and arguably the most stunning location in the country to watch live music, Watergate Bay. Last year saw Boardmasters welcome over 150,000 festivalgoers across its two sites over the 5 days of the festival. 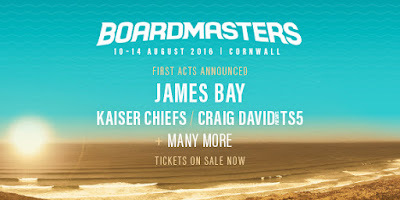 Boardmasters operates a tiered ticket system with price bands for tickets changing over time. The sooner you buy, the cheaper it is! Book tickets via the website.